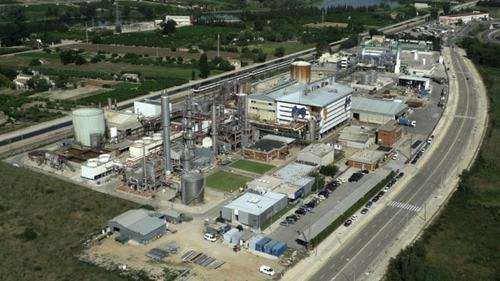 Barcelona - The Ercros factory in Tortosa has launched an expansion of its production capacity of polyols in order to meet the growing demand that this product range has in the market. The polyols manufactured in Tortosa are pentaerythritol and dipentaerythritol, which are used to make paints and varnishes, high performance synthetic lubricants and printing inks; and sodium formate, which is used as deicing in airports and in the tanning industry. The combined capacity of the pentaerythritol and dipentaerythritol plants has increased by 5,000 t/year, which represents an increase of 17%, reaching a total capacity of 35,000 t/year; in the case of the sodium formate plant, the increase has been by 3,000 t/year, also a 17%, reaching 23,000 t/year. The investment carried out to expand the capacity of these plants comes together with technological improvements in the manufacturing processes and a greater energy efficiency, improving, as a result, the competitive position of this particular factory and of Ercros, in general. These technological advances are the result of the internal work of the department of R&D and engineering of Ercros intermediate chemicals division. The factory in Tortosa supplies almost all consumers of the Spanish market and exports the rest of the production, approximately 80%, to more than 48 countries. The greater product sales volume available that allows the expansion of the aforementioned plants is entirely destined to the foreign market aiming to consolidate and expand the presence of Ercros in America, Europe and Asia. The company is the Spain’s first, Europe’s second and world’s third marketer of polyols.